When I was teaching, one of the aspects of the job I loved the most was taking a concept that my students needed to know, and creating a unique and interesting way to deliver a lesson that would teach that concept. It was exciting and risky. I guess that was what I liked most about it – the risk. What if this lesson bombed? What if the principal walked in and saw me playing the piano or writing a class rap with the students? What would he/she think? These questions, in the beginning, would make me think twice about abandoning the tried and true lessons that I and countless other teachers had used throughout the years. Thankfully, I had earned enough respect of my administration that if I came in dressed up as MC Mr. Rangel, they would understand. The kids loved my classes, and they learned. I had a lot of fun too. I miss those days of creating lesson plans. Now that I’m sitting in the administrator’s chair, I wonder if creativity in lesson planning is becoming a thing of the past. There are so many other demands on teachers, that taking time to create an fresh and engaging lesson seems to not be that important anymore. I find that yes, there are still many teachers letting their creative juices flow while they’re planning for next week’s lesson. There are still many teachers who are willing to take a risk with a lesson, willing to see a lesson totally bomb in their desire to make their class and the concept one that is memorable to their students. We love these teachers. We seldom hear about behavior problems from students in their classes. These teachers seem the happiest. I also find, however, that many teachers are teaching their students the same old boring way. The desire to be creative with a lesson seems to fade with every year that passes. I totally get that it’s much easier to pass out a textbook and have the kids read a chapter and answer the questions at the end. I completely understand that it takes time, effort, and sometimes money, to create a memorable and engaging lesson plan. I know it’s a risk. Still, I wonder what would happen if every teacher on campus was taking time to be creative with their lesson planning. Although my days of creating lessons are over, I wonder if I can use my position as administrator to encourage creativity in others. I can encourage teachers to take risks. I won’t hold it against them if the lesson bombs. I’ll applaud the attempt. I can acknowledge and publicly recognize teachers who are being creative in the classroom. I wonder if teachers are hesitant about being creative in their lesson planning, because it’s not something that administrators are looking for – it’s not valued by the administration. I believe that if administrators make lesson plan creativity a focal point in what they look for in a clasroom, the entire school will benefit. 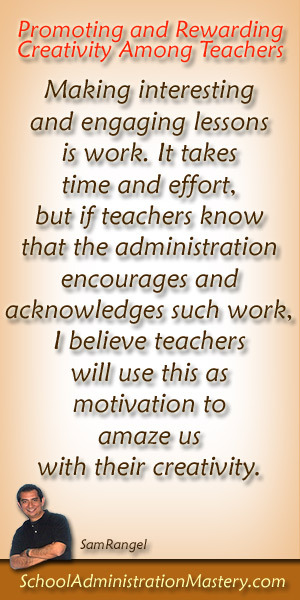 I believe that teachers will be happier, because they’re not just going through the motions of delivering a lesson. I believe there will be fewer behavior issues, because an engaged student is not a behavior problem. I believe more students will connect with the lesson, and thus more students will be learning – doing better on assessments, etc. 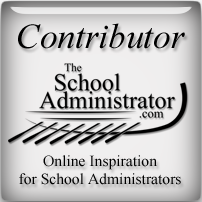 As I move forward on my journey toward school administration mastery, I am working on my goals and new objectives to keep improving and having a greater impact on those around me. One of these new objectives is to encourage, promote and reward creativity among the teachers. I want them to invite me in to see their class when they try this creative lesson for the first time. I want to share creative lessons with the rest of the staff. I want teachers to know that I value their creativity and desire to give their students a memorable experience in the classroom. Making interesting and engaging lessons is work. It takes time and effort, but if teachers know that the administration encourages and acknowledges such work, I believe teachers will use this as motivation to amaze us with their creativity.